Debswana and Botswana International University of Science and Technology (BIUST) have joined forces to develop skills in sciences, engineering, technology and innovation. They have signed a memorandum of understanding (MOU) aimed at meeting the skills demands of a changing world. 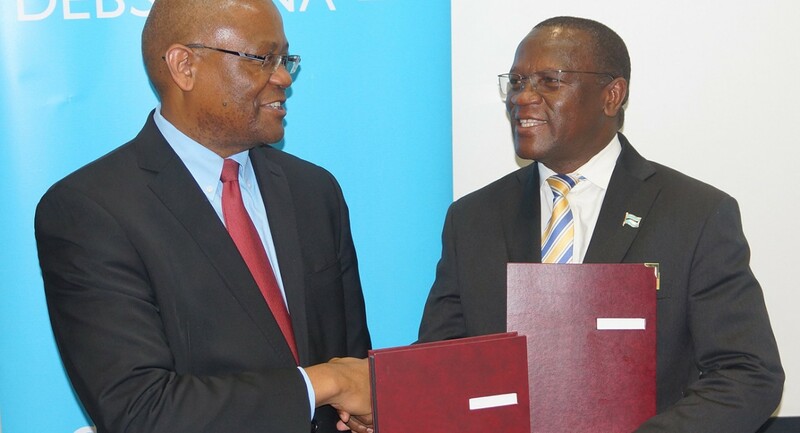 Debswana Managing Director Balisi Bonyongo (pictured, left) described the MOU as an historic moment because it was the first the company had signed with a university. He said that, even though Debswana employed a total of 11,000 people (including 6,000 contractors), it still faced a shortage of critical skills. So the company had reintroduced its Debswana Scholarship Programme to help fill the gap. The partnership between the company and the university would complement the company’s efforts on skills development. Through the MoU, signed at Debswana’s headquarters in Gaborone, the two partners will specifically collaborate on areas such as coarse tailings and fine residue depositories, geochemical studies, water and slurry/slimes testing, mining and metallurgical processes, and diamond recovery systems. University Vice-Chancellor Professor Otlogetswe Totolo (pictured, right) said the MOU was a milestone in its journey of skills development. BIUST and Debswana intended to help Botswana leapfrog to a knowledge-based nation with products and services that made life better for Batswana and contributed to the nation’s wealth and well-being. He added: "BUIST and Debswana complement one another. Our synergies are our strengths, and our collaboration is our reason for the huge investment that our people have made in us. The MoU cements the collaboration that both BIUST and Debswana seek to have."